Every person is capable of experience a dazzling range of different mental states. These include cognitive states, such as planning, decision-making, or calculation, as well as emotional states such as joy, misery, exhilaration, or exhaustion. These states are dynamic: they evolve over time. One way in which they evolve is in terms of intensity: some states start out intense and gradually taper off, others take a long time to build, and still other show other patterns of intensity over time. In this study, we are interested in learning about how you think different mental states change in intensity over time. To help us in this endeavor, you will draw the "temporal profiles" of your emotions - curves which represent how they ebb and flow in intensity over time. In the process, you will get to compare your perceptions of these mental states to the average of drawings provided by other participants. The task you will engage in consists of drawing the "shapes" of emotions over time. On each trial, you will be prompted with the same of a particular mental state, such as happiness or fatigue. You will also be shown an empty set of graph axes the horiztonal (x) axis refers to time, and the vertical (y) axis refers to intensity. 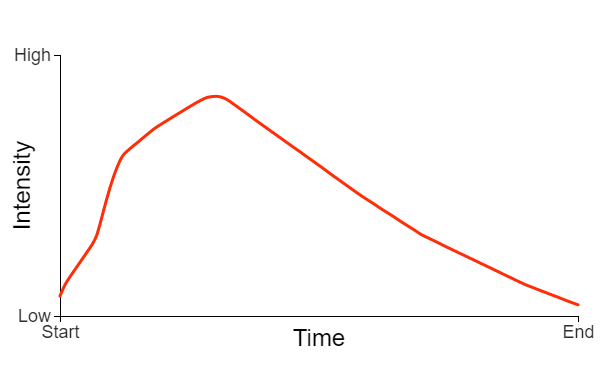 Using your mouse cursor or touchscreen, you will draw a curve from left to right indicating how the mental state in question changes in intensity over time, like in the example image above. If you don't like the curve you draw, you can reset the axes and try again. Once you're satisified, you will indicate that you accept the current drawing and complete that trial. After you complete the trial, your response will be normalized to a common template. You can then compare your response to the average response provided by other participants for the same mental state. This is a variable-length experiment: you decide how long you want to participate. Thus you can respond to just one trial, or to all 150+ mental states in our database - whatever you have time for is appreciated! Whenever you decide to finish, you will get to view and compare the shapes (both your own and others') of all of the mental states. If you're ready to participate in this study, please click the 'begin' button below.